Fujinon XK6x20 (XK6x-20) 20-120mm T3.5 PL Mount Cabrio Cine Lens (Rental) - Z Systems, Inc.
PRE-ORDER. Designed for the video production and PL cine markets, the 20-120mm Cabrio XK features a T stop of T3.5 end-to-end, a 20-120mm focal range, and industry-proven Cabrio flexibility – at an affordable price. Designed for the video production and PL cine markets, the 20-120mm Cabrio XK features a T stop of T3.5 end-to-end, a 20-120mm focal range, and industry-proven Cabrio flexibility – at an affordable price. It is also equipped with a unique detachable servo drive unit, making it suitable for use as an ENG-style or standard PL lens.The 20-120mm Cabrio XK covers a S35-sized sensor (Super 35 format) on a digital cinema-style camera. The 20-120mm Cabrio is also fitted with a nine-blade iris, to capture the most natural looking imagery possible. It comes equipped with all the lens data outputs that are required by today’s cine-style shooters. In addition, the 20-120mm Cabrio XK can be controlled using cinema industry standard wireless controllers, as well as existing Fujinon wired units. Meanwhile, the zoom’s barrel markings are luminous for visibility in dark shooting situations – a nice-to-have touch that reflects the company’s deep understanding of real-life cinema shooting conditions. Distances are listed in feet or meters. 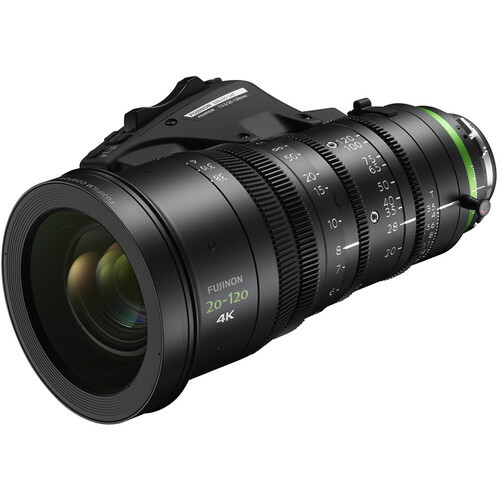 Fujinon’s PL 12-120mm lens is the latest development in the company’s popular Cabrio series, which includes the Premier PL 19-90mm, the PL 85-300mm, PL 14-35mm lenses, and PL 25-300mm. This item is projected to be available Summer of 2016. We have a limited quantity of pre-orders available now.